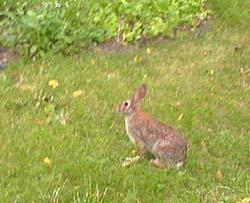 On Tuesday, just after passing Linda on “a great run” I arrived home to find a rabbit sitting in the middle of our yard. A picture from my phone camera is in the gallery. It hoped away before I could get my good camera. I hope it doesn’t nibble away all of the “spicy mixed greens” I am growing (seen in the background). On Sunday at the end of walk through the arboretum I ran into a raccoon eating some french fries on the steps next to the hospital helipad. I’ll upload a picture just as soon as I can get a reliable network connection, lately the one at home has seemed flaky. I’m also working on uploading pictures to fill out my 2005 – CERN folder, but I may have to do that from my office.